TriMark features a single-key locking solution for the operation of multiple locking products. The patented KeyOne™ Plus approach features a modular lock cylinder design that allows for a single key system that can be easily installed as the last step by the final stage manufacturer. With the KeyOne™ Plus locking solution, you're getting an automotive-style lock with a larger body diameter for enhanced security, a high quality shutter system and perimeter waterproof seal - reducing the infiltration of dirt and water. Available on most TriMark entrance door handles and baggage/compartment locks, the lock cylinder and keys are available in a wide variety of codes allowing the customers' flexibility in keying a unit alike and keyed different from unit to unit without giving up overall security. The keys are available in reversible profiles which offers ease of operation, customer convenience and satisfaction. This system also allows for certain products or locks such as a deadbolt lock to be keyed different for an added level of security or restricted access. Master keyed versions are also available, providing dealers, fleet owners, and service technician's shared access providing further convenience and accessibility. Additional options allow for the ability to custom match existing customer codes or select a new key code that would be unique to the industry and application. This system addresses another challenge for OEM's, the logistics and line sequencing for the keyed random key codes across their various models and options mix. 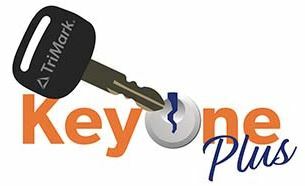 This program is titled "One Key – One Vehicle" and is supported with KeyOne™ Plus by providing the OEM the opportunity to line sequence the key code requirements without having to order key cylinders or hardware kits keyed alike in advance of build requirements. The use of the modular KeyOne™ Plus locking solution can be extended to include ignition locks, fuel caps and other points of access that would benefit from sharing lock cylinders and key code coordination. An additional benefit is the opportunity to service, replace or upgrade the lock cylinder at any time offering OEM's, dealers and end users the option to adjust the level of security and convenience or replace in the event of lost keys or lock cylinder failure. Look for the KeyOne™ Plus logo in TriMark literature, technical publications and on the TriMark website at www.trimarkcorp.com for products that do not sacrifice security or convenience.